Lansweeper is an automated network discovery and asset management tool which scans all your computers and devices and displays them in an easy accessible web interface. There is no need to install any agents on the computers, all scanning is done by standard build-in functionality. Lansweeper gathers all your computer's active directory information which makes it easy to create specific reports or drill down based on organisational unit. Lansweeper scans over 60 different specifications of your computers. Browse the web interface to see all software installed on your computers. Software can be approved for compliancy reasons and you can Google unknown software. If you want to digg deeper you can drill down on the software's publisher and version. 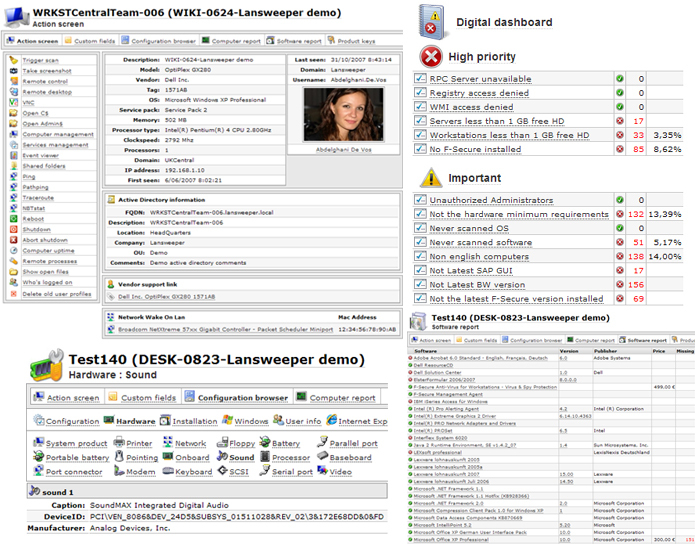 Lansweeper contains over 200 build-in reports in the default installation. With the report builder you are able to make your own reports. With the possibility to scan custom files and registry keys the reports you can make are endless. Lansweeper gathers all your computer's active directory information which makes it easy to create specific reports or drill down based on organisational unit. Lansweeper gathers all active directory user details of all logged on users and stores it in the database. Qweas is providing links to Lansweeper 4.2.0.86 as a courtesy, and makes no representations regarding Lansweeper or any other applications or any information related thereto. Any questions, complaints or claims regarding this application Lansweeper 4.2.0.86 must be directed to the appropriate software vendor. You may click the publisher link of Lansweeper on the top of this page to get more details about the vendor.